The feeling of a heart palpitation is unmistakable to anyone who's had one---it feels as though the heart has stopped or is fluttering in the chest, and it can induce feelings of panic or being unable to breathe. While most heart palpitations are completely normal, particularly during pregnancy, they can be disconcerting and scary. Almost everyone has palpitations from time to time, though many women experience them more frequently during pregnancy for a variety of reasons. A pregnant woman's body contains far more blood---up to 50 percent more---than that of a non-pregnant woman, explain Heidi Murkoff and Sharon Mazel, in their book "What To Expect When You're Expecting." This provides for the needs of the growing baby by ensuring that there's plenty of blood for both mother and fetus. Unfortunately, a pregnant woman must move that significantly enhanced blood volume around her body with the very same heart she relies upon while not pregnant, meaning that the heart has to work much harder during pregnancy than during other times. The increased workload forces the heart to beat with greater force and more frequently in order to keep blood pressure adequate; this results in more frequent "errors" in heartbeat---moments during which the beat becomes a bit asynchronous---and these errors are felt as palpitations. Typically, they last only a few seconds, and are generally not accompanied by any other symptoms. The hormone progesterone, notes Dr. Raymond Poliakin in his text, "What You Didn't Think To Ask Your Obstetrician," is more concentrated in a woman's body during pregnancy than at any other time in her life. This hormone is responsible for a number of the physical and emotional changes she experiences. One of the effects of progesterone is that it causes the heart to beat faster and harder. This allows for adequate circulation of blood to the uterus even before a pregnant woman's blood volume increases, meaning that even the early weeks of pregnancy---during which she has a normal blood volume---her heart rate is generally much faster than normal. Since progesterone makes the heart work harder, it increases the error rate of the heartbeat, leading to occasional palpitations. Pregnant women have lots to worry about---their changing bodies, the health of their baby, the impending pain of delivery---it's no wonder that they're often a little more stressed out than normal. In their book, "You: Having A Baby," Drs. Michael Roizen and Mehmet Oz explain that stress, regardless of the cause, increases the heart's workload, and consequently increases the frequency of palpitation. While palpitations can occur with greater frequency during any period of stress, since pregnancy is so commonly associated with a chronically increased stress level, it's not unusual for pregnant women to have periodic palpitations throughout pregnancy. 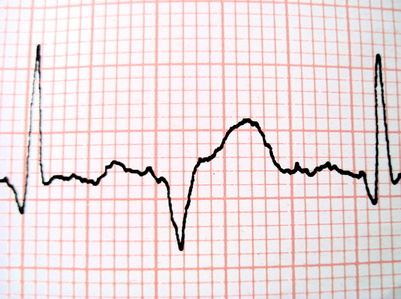 What Are the Causes of an Irregular Heartbeat During Exercise?